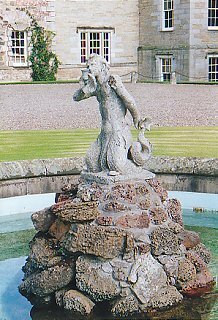 Located 7 miles (11 km) northwest of Kelso, Mellerstain is the seat of the Earls of Haddington. This fine house has the external appearance of a fort, and was built in two distinct stages. The initial development in the form of the two wings was commissioned by George Baillie of Jerviswood and his wife Lady Grisel Baillie (1665 - 1746) in 1725. William Adam (1689 - 1748) was the architect. In 1770, his son Robert (1728 - 92) built the main block linking his father's wings. While the exterior is fine, if not remarkable, the young Adam's work inside is stunning. The state-rooms are grand but his library is the jewel; the delicate plasterwork includes large Wedgewood-esque plaques portraying classical themes and amidst the detail on the ceiling are depictions of Minerva, 'Teaching' and 'Learning' by Zucci. Every detail has been beautifully maintained, along with the original colours. On the death of the Baillies, Mellerstain passed through the marriage of their daughter to the Haddington Hamiltons, and in 1858 the title of Earl of Haddington came through that family to the then-owner of the house, George Baillie-Hamilton, who became the 10th Earl. The 11th Earl of Haddington commissioned Sir Reginald Blomfield to refine the landscaping of the grounds, a task he completed admirably, creating a grand vista in 1909. Today Mellerstain is home to John Baillie-Hamilton, the 13th Earl of Haddington, who in 1986 placed the ownership of Mellerstain in the hands of a charitable trust to ensure its future.